Gillian C. Fazio was raised in Lakeland, Florida and began her art education at Rochelle School of the Arts. 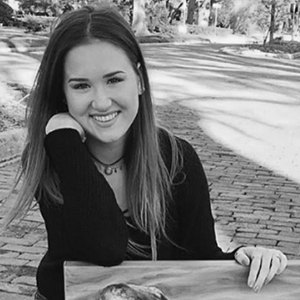 After attending both Lois Cowles Harrison Center for the visual and Performing Arts and Lakeland High School, Gillian earned her Bachelor’s degree in Fine Art from the University of Florida. Her work focuses on flora and fauna juxtaposed with human culture, looking at how they function together in one picture plane. These unique and colorful compositions are made through combining photographic references rendered into paintings. In keeping with Gillian’s love of large scale paintings and murals, Lakeland Tapestries is a wonderful opportunity and an honor to share her work with the community of Lakeland. 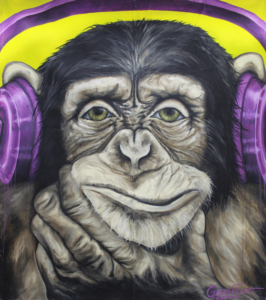 Inspired by the Japanese proverb, “The Three Wise Monkeys”, this painting takes on a modern cultural twist by replacing the hands over the Chimpanzee’s ears with Beats headphones. I wanted to push the personification aspect by choosing a contemplative facial expression, creating a more specific identity for the Chimpanzee that resonates with today’s society. 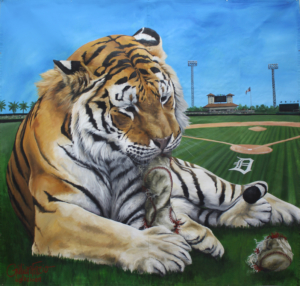 This painting is a nod to the Detroit Tigers by replacing their costumed mascot with a wild tiger set loose on their spring training field. Placing a wild animal in an urban sport setting creates a playful dialogue of what the tiger might be doing in such an environment. This image is inspired by the ancient landmarks Stone Henge and Easter Island. The hand gesture “peace” made of stone references a more universal sense of time and space, while the lush flora growing from the stone foundation represents the utopian idea of harmony between mankind and the natural world.